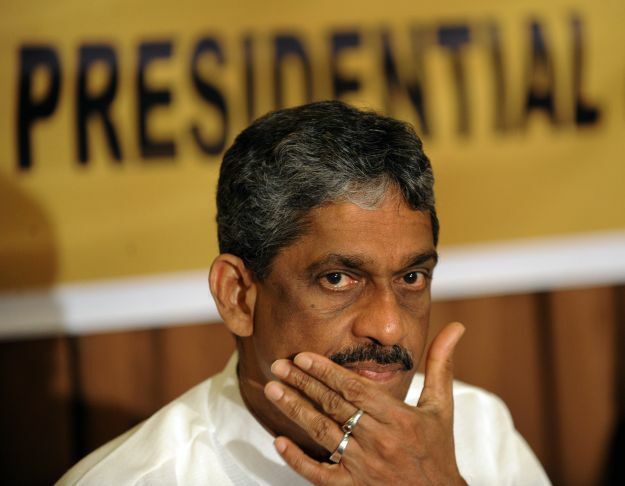 Regional Development Minister Field Marshal Sarath Fonseka has sought approval from Parliament for Rs. 592 million to cover the expenses of his ministry. Chief Government Whip, and Minister of Mass Media and Parliamentary Affairs Gayantha Karunathilake presented the supplementary estimate to Parliament on behalf of Fonseka. Fonseka has sought approval of Rs. 469,425,000 for recurrent expenditure and Rs. 123,500,000 for capital expenditure for his ministry. Fonseka who was appointed as a Minister in February this year, came under heavy criticism from the public after he accepted Rs. 70 million to purchase a luxury car for himself for official use. In June, the Government sought approval from Parliament for a whopping Rs. 1.1 billion to purchase 32 brand new luxury vehicles for the use of ministers, and deputy ministers. This guy is getting ready for his next Welikada Tour under the next Administration’s FCID. Not him, but his tharahakarayo… SF has been the honest person of all lanken politics. He will never try to grab funds as has been the case of your God father Rajapakshes. Raj, you are absolutely right. When SF had the power, all the army procurements went to a company headed by his son-in-law. When the heads were arrested, the son-in-law absconded before the trial but a colleague was convicted and jailed. There were also several accusations of molesting junior female army personnel but that’s another story. You must be an alien from an unidentified planet. Do you know the meaning of the word’GRATITUDE’? He’s still got shrapnel embedded in his body you stupid. I bet you’ve got lots of ‘Gelt’ from the Jarapassa loot. Was it Mr, Gota, Basi, Namal, Yoshitha or Deal Dasa passed you som of the loot? Lol.. you should get a life first!!! Fonseka is a politician totally rejected by the people.. just a liability to the UNI government.. greedy too! What about you? What was your service to your country. Let us see what you are first before we react to your comment. How did he got the sharpenel in his body? He is the only army commander who got blown up by enemy within his own head quarters. That says a lot about this man. Hmmm…………was it an inside job?. Only the corrupt Rajapassas’ can tell us. People know him well that is why they didn’t vote for him. However, Prime Minisrer Ranil brought him; let Ranil deal with his extravagant spending spree. Very same pepople voted for Buruwanse the most abusive man in the spot light. SO can you at all keep the faith on this people ? SF could better be away as a retired person, but he thought he should do more to the nation and after all do the maxmum to get Rajapakshes cornered. The process is a snail move. That hurts him. Can you guys ever be silent the way MR regime took revenge on SF ? I guess not a single men on this planet would stay away – it was truly the real revenge made to a human being. SF sacrificed over 40 years but Gota enjoyed his life being in greener pastures until his abusive brother took the office. So the propaganda was made in favour of them, telling the gullible masses that Gota s knowledge and cleverness was so fine. If we question ourselves we perfectly know anyone who stayed away would not have more knowledge about A to Z of a system. How could Gota be better informed than SF in terms of lanken army ? That should be a magic. I live on the west over the last 3 decades, my knowledge about lanken systems are not the best though I lived my younger days in the country. WITH my knowledge if i woudl start working any job inthe country, i may need to study the systems longer .. some times years long… but Gota to work as the top expert ….. as LANKEN press painted it… is a real joke to me. Very same press men lifted Mr Abusive and put him on the SKY by calling him Rajathuma. Jackson Anthonies speech was targeted to outreach the masses and brainwash them for their political dynasty. Today, we need to interview that very same actor and ask him to reveal what he knew about the magical powers of the Meeharaka Rajakashes.. if woudl not agree, need to ask him why the very same Leader failed not being able to handle even tiny issues such as start with reconciliation of the volks after long war… or why he failed to manage the lanken state funds.. why allowed any simple simon to breed as high corrupted businessmen: Even today, the current rulers are not strict enough with their measures being taken against the former men… I think it s high time them to react today than waiting longer. If not the chance will be missed and nobody can turn this a good nation. Field Marshal Sarath Fonseka: Just consider how comfortable and gracious you would have been, if you retired having obtained the title of “Field Marshal” and Pension. It is better late than never. My dear Duggie, I agreed with you, but this man is a workaholic and a real ‘Patriot’ unlike the ‘Cardboard Jarapassas’. How did they buy a fancy house and fancy cars including a BMW when he was Commander? How was the ex son in law involved in being a consultant and arms dealer and how did the ex son in laws mother have 800million in cash? Through cutting hair at Galle face? will there be enough money left for regional development?Just a thought. FM-SF is the only person on this planet can and will put all the Jarapakshas in jail for life..
What exactly, is “Regional Development” – the task of the Field Marshal? he develops the regions that were damaged by the woman suicide bomber. Who needs to pilfer money from contracts when all you need to do is get cabinet approval for insane amounts of money direct. Direct theft legally sanctioned. Money for SF’ Ministry should come entirely from few other Ministries like Agriculture, Rural economy, allocations meant for provincial councils etc.etc .The latter ministries if properly managed should add money to the state coffers.The entire half a billion or even more could be got if the departments under several ministries are reallocated and duties properly assigned.Creating Ministries haphazardly to help frogs to jump prom opposition has made rural sector almost inefficient and bringing Rural Development to a complete standstill.The only solution is to do a complete Cabinet reshuffle and reallocate departments to make development and rural administration efficient.Public spending can be cut down by half.Regional Development and Rural economy in this small island should be managed by professionals. Why the country,s intelligentsia keep out of this mess the President should understand, he should blame himself for the deteriorating progress of the Country.Mr.President, spend more time of the 24 Hours speaking to the Professionals without wasting time on unproductive work.Remember we are a debt ridden country. anonymous: Thank you. I agree. He is a good man. No doubt about it. This step taken by him is not at all that correct. How do you compare SF’s request for setting up a new Ministry, renting a building for the ministry of agriculture, purchase of fighter aircrafts when there is no known threat from any of the neighbouring countries?. Come on, he is an old man with a lot to offer. He has transformed himself by spending time in jail, thanks to the ‘Jarapasses’. I am just being unbiased here. Everyone knows his record knows his flaws. That is why they could not even get 50,000 votes in the Parliamentary election. He is a military man hardened and brilliant but still a military man with a dictatorial mentality. He will exact revenge if and when he can in military manner. Ranil after insulting him so much, is using him as a weapon of distraction against MR. I thought he collected 4.5 million votes against Mahinda Jarapaksa in the presidential elections even after stealing ballot boxes and all sorts of ‘Jilmarts’ by the brothers and the goons. Correct me if I am wrong Mr. Desapriya, the EC. Wan’t it a 52.5% 45% ratio ?, or I am imagining things?